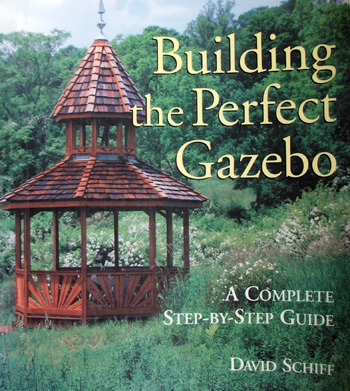 I found this book in the local library, and as a non-builder of gazebos I immediately saw its incredible potential. I loved the different pictures of ready-mades, nestling in beautiful gardens, as well as the detailed sequences of builder's hands measuring, cutting, and fitting pieces of wood together. I always thought I'd like a gazebo, but this book has convinced me that I definitely want one. I can choose between four, six, or eight sides, I can have trellis or railings, I can even have a gazebo with a tiny tower reached by a ladder. I can a raised gazebo (I'm thinking it's a belvedere) with steps contructed to reach it. Publisher? Details to come, sorry.